Whenever I hear the word “mosaic,” I think of pretty things such as eye bedazzling mosaic stone or glass tiles in the landscape or in the home. However, the word “mosaic” is also associated with not-so-pretty things, such as mosaic virus in plants. This virus affects brassica crops such as turnips, broccoli, cauliflower, and brussels sprouts, just to name a few. But what about cabbage, you ask? Why, yes, there is also mosaic virus in cabbage – it is a brassica crop after all. Let’s take a closer look at cabbages with mosaic virus. So what does mosaic virus in cabbage look like exactly? Generally speaking, cabbage mosaic virus presents itself as follows: Yellow rings begin to form on the young leaves. As the cabbage head develops, you will notice that the head begins to take on a mottled or “mosaic like” appearance with a smattering of various colored rings and blotches, which in some cases turn black and necrotic. The veins of the cabbage leaves could also show signs of chlorosis. Let’s just say the head of cabbage starts to look very icky and not very appetizing. How does cabbage contract mosaic virus and how do you control mosaic viruses affecting cabbage? One avenue of new cabbage mosaic virus infections is via aphid populations. There are 40-50 species of aphids that have been known to transport this virus from one cabbage plant to another, but two aphids in particular take a bulk of the credit: Brevicoryne brassicae (cabbage aphid) and Myzus persicae (green peach aphid). If you have aphids in your garden, then you will need to take measures to dwindle their population in your garden, as they are not just only a threat to your cabbage, but everything else you are growing. 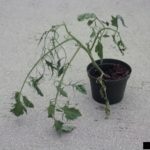 The disease can also be spread when the infected leaves of one plant simply touches those of a healthy plant. Plants infected with mosaic virus should be removed (do not compost) from your garden immediately for this reason. 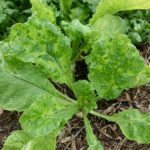 This virus can make a comeback every gardening season because it has the ability to overwinter in perennial herbaceous weeds (which aphids also feed on). Therefore, keeping your garden routinely weeded is highly recommended. The general recommendation is to keep your garden free of perennial weeds within at least 100 yards of your garden area. 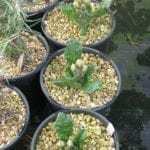 It is important to note that there is no cure for cabbages with mosaic virus once they become infected. 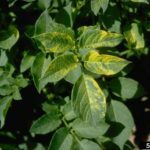 The damage cannot be undone by a fungicide application. Good garden sanitation and insect pest management are the best means of keeping mosaic viruses affecting cabbage at bay.